As promised from earlier today, here is part two, the healthy part, of our easy Christmas breakfast. Smoothies are my jam so when I was thinking of a nutritious way to round out our easy breakfast I knew exactly what I had to make- a Christmas (aka cranberry) smoothie. This one is full of all kinds of healthy and delicious things (like Be Bright Superfood Oil, which you can find out more about in the recipe below) to keep you on track in a season that is akin to a real live Candy Land. And just like that your simple and easy Christmas morning game plan is good to go. 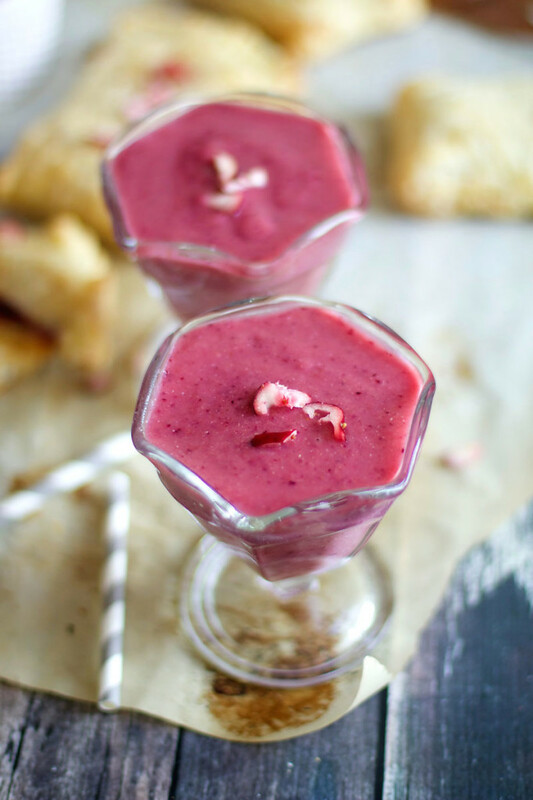 Wake yourself up with a cookie, open presents, sneak in a few more cookies, make cranberry pop-tarts, hope no one notices as you grab one more (small) cookie, blend together this cranberry smoothie, and voila, Christmas breakfast is served! Hope you all have a lovely holiday wherever you are celebrating! We're off to the Midwest to enjoy the next few days with my family (and my Mom's chickens, obvs). I'll see you back here next week, but in the mean time, you can keep up with all the Runway Chef adventures over on my Instagram or Mr. RC's Instagram. Happy holidays and merry Christmas! You can also use cranberry or orange juice or almond milk in place of the water. The nutritional supplements (oil, chia seeds, and brewer's yeast) all provide an extra dose of healthy (which we all know we can use this time of year), but they are optional. For me, I use brewer's yeast for the added dose of vitamin B and I use chia seeds and a nutritional oil to get an extra dose of omegas. Lately, I've been loving Be Bright oil blend....it has a creamy coconut flavor that tastes delicious in smoothies. I'll link to it below this recipe.